In this tutorial you will learn how to create a simple disappearing text effect in Flash. The results of this text effect will show each individual letter in the sequence disappear in order. You need to use the alpha property for this effect. I have used an Actionscript 2.0 file for this tutorial, but an Actionscript 3.0 file should also work fine. Select your text tool and type your message on the stage. I have used Impact font type with #FF0000 colour, but you can use whatever colour or font type you wish. Select your text message with the selection tool (V) then right click and select Break apart. Convert each letter of your text message into a symbol by pressing F8. Give your letter an appropriate name, check movie clip and click ok.
You can experiment with the various settings if you wish. I have added 130 % for the strength and 6 pixels for the distance. Select all your letters on the stage again and right click then select Distribute to Layers. This splits all your letters onto separate layers. On the timeline for all your letters, right click in between the two key frames and select Motion tween. 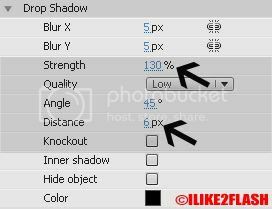 If you are using Flash CS4 then select Classic tween. Select the second key frame for your first letter on the timeline, then the click the letter on the stage and change the Alpha properties to 0%. Repeat this for all your letters. You should now have a disappearing text effect. Feel free to contact me for any questions or comments and remember to subscribe. You can download the source files here. hi...this looks so great but i have one problem - when i want to distribute to layers, i don't get all layers separately in the timeline, only the last one appears for some reason (i did selection by Cntl + click on each letter). Help, thanks! You need to make sure you have selected all the characters. If this does not work, you can try manually placing the letters into separate layers.